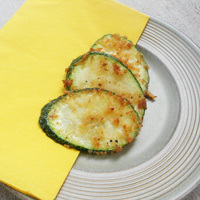 This is a light summery version of fried zucchini that isn't too greasy or heavy. 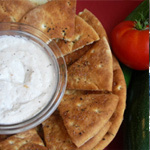 It's pretty enough to eat with guests in the backyard and simple enough to eat right over the stove. 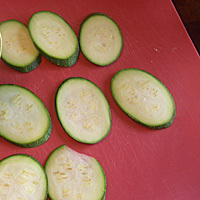 Cut zucchini thinnly on the bias, creating longer angled pieces. 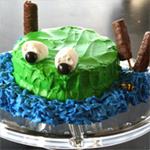 Assemble everything before you begin, since the cooking process is very quick. Begin heating a frying pan or fryer on med high heat. Place two bowls by the stove. In the first bowl, beat two eggs. 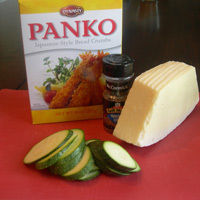 In the second, combine panko, steak seasoning, and parmesan. 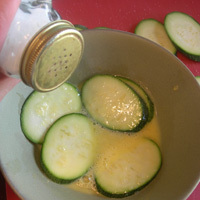 Dip each slice in egg and sprinkle with salt and pepper. This helps the seasoning stick but also creates another dimension of flavor, as opposed to adding the salt directly to the batter. Liberally coat each piece with breading. Press firmly and sprinkle more on top once they make it to the pan. Add enough oil to liberally coat the bottom of your now hot pan. Work in batches, and don't crowd the slices. 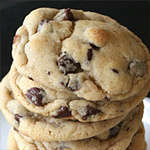 When the under side is lightly browned, about 30 seconds, flip. Cook another 30 seconds or so on the other side and remove to a paper towel to absorb excess oil. Plan on about 3 or 4 appetizer slices per person, or about 10 for me if I'm coming. 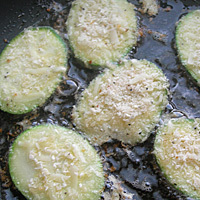 Problems: If the oil isn't hot when you put the zucchini in the pan, it will take much longer, and the zucchini will take up much more oil. The result is very greasy. 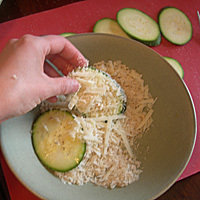 Cut zucchini thinnly on the bias, creating longer angled pieces. 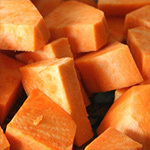 Assemble everything before you begin, since the cooking process is very quick. Begin heating a frying pan or fryer on med high heat. Place two bowls by the stove. In the first bowl, beat two eggs. In the second, combine panko, steak seasoning, and parmesan. 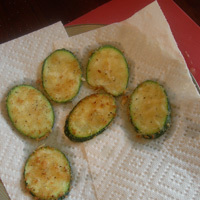 Dip each slice in egg and sprinkle with salt and pepper. 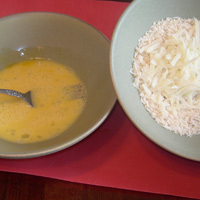 This helps the seasoning stick but also creates another dimension of flavor, as opposed to adding the salt directly to the batter. Liberally coat each piece with breading. Press firmly and sprinkle more on top once they make it to the pan. Add enough oil to liberally coat the bottom of your now hot pan. Work in batches, and don't crowd the slices. When the under side is lightly browned, about 30 seconds, flip. Cook another 30 seconds or so on the other side and remove to a paper towel to absorb excess oil. Plan on about 3 or 4 appetizer slices per person, or about 10 for me if I'm coming.